2018 is over and the new school year is just around the corner! To all the new families, welcome to Willowbank and to our returning families, we look forward to seeing you back in 2019. The new school years starts on Monday 4th February 2019. Information regarding enrolments, uniforms, stationery is below. Stationery can be ordered from Officemax MySchool - these lists will be available now for purchase. For new entrants who are starting school for the first time, please use the Kiwi Pack. The school uniform is avaible at John Russell Schoolwear. On the first day, returning students can go straight to their new classroom. Students who are new to Willowbank need to come to the office and we will take you to your new classroom. School starts at 8:55am but it will be good to arrive at school between 8:30am and 8:45am so that you can get settled into your new class before the bell goes. Please bring your stationery with you on the first day. Remember to name all items of uniform, their shoes, lunch boxes etc. There are stick on labels / iron on labels available at companies such as Stuck on You or Name It. If you are going to use the washable pens, please make sure the name is legible as over time they do fade and are difficult to read. 'Seesaw' is a learning journal that captures aspects of students learning that happens during the school day. It gives students a voice, making their thinking visible and encourages student ownership of their learning. Seesaw builds reflection, creation and builds a stronger communication link between home and school. Parents are able to access the app to keep up to date with class events, activities and learning. Willowbank School is continuing to use Seesaw over 2019, to provide a platform for you to be further involved in your child's learning through digital sharing. Students will be using this over the year to share their learning, with teachers using this to share notices, newsletters and announcements to keep families informed. Each child has their own individual QR invite for parents to join their 2019 Seesaw Journal. These will be organised once school starts again. Policies are monitored by SchoolDocs and updated, modified, or created in response to changes in legislation, significant events, Ministry guidelines, reviews/requests from schools, and regular reviewing from the SchoolDocs team. Our board of trustees has the opportunity to view changes and additions and comment on them before they are implemented. Order fresh made, hot & cold lunches from Daily-Bread through ezlunch.co.nz (easy-lunch). Order before 9am for delivery at lunchtime. There’s plenty to choose from every day. Ready to order? Click here to login. All lunches are delivered clearly labelled with name and room number and arrive at the school office in time for lunch. Payment is by ezlunch account, in advance or pay-as-you-go, with three ways to pay (bank transfer, Account2Account transfer or Credit Card). Any payments can be made by online banking, cheque/cash or Eftpos at the school office. If you are sending money to school with your child, please send it in a sealed envelope with your child’s name, room number and what the money is for written on the outside of the envelope. We have large stocks of Jumpers of all sizes, so come on in to our black box beside ESOL. Click here to open details of the requested donation. For details on the 2018 Walking School bus routes, click here. We need parents to help with the walking school bus - even one afternoon a week would be a great help. Click here to open the Admistration of Medicines procedures and form. 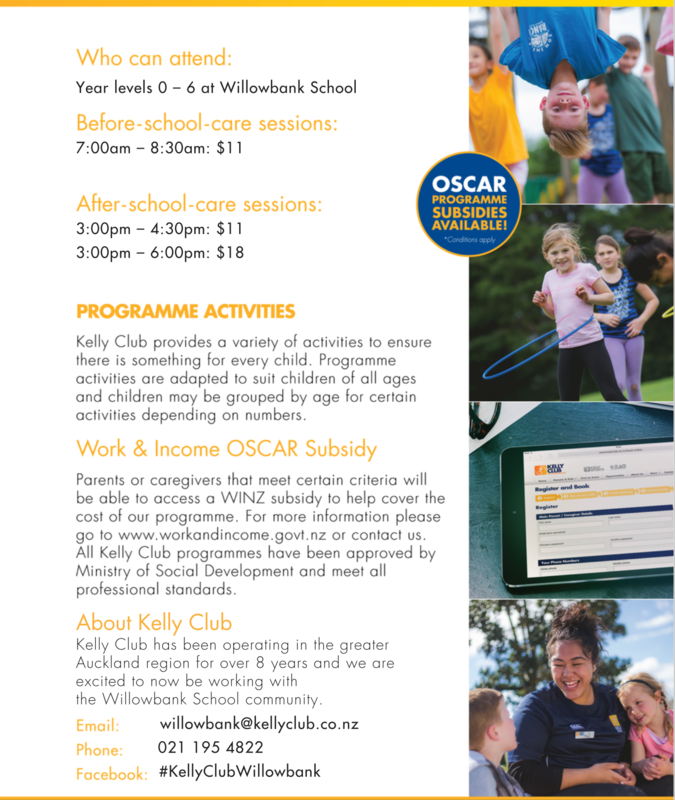 Click here for the form if your child is leaving Willowbank School to go to another school.